This production opened on August 12, 2015 and closed on August 16, 2015. 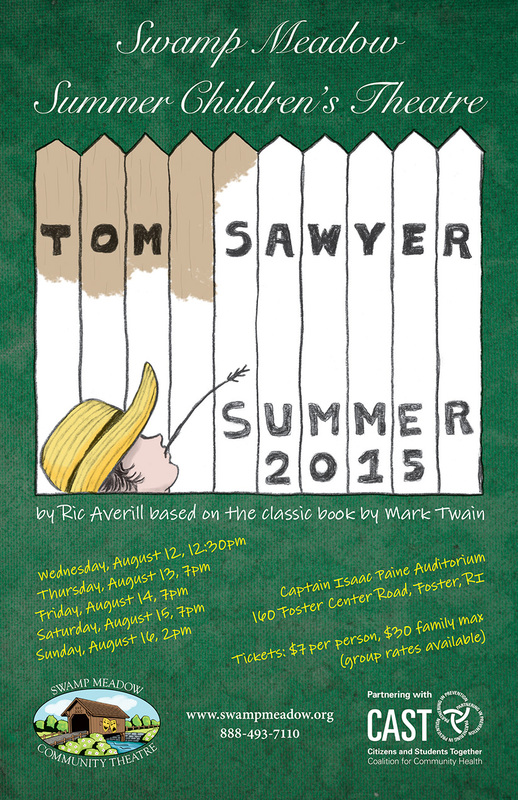 Mark Twain’s classic tale of childhood on the Mississippi comes to life this summer in Swamp Meadow’s Summer Children’s Theatre production of Tom Sawyer, based on the book, The Adventures of Tom Sawyer. Here is our wonderful and talented cast! Rehearsals are Tuesday and Thursday nights from 6-9PM starting on June 16th at Woody Lowden until Thursday, August 4PM after which time we move to Captain Isaac Paine School (Google Maps Link). Rehearsals at the school will be 6-9PM (possibly 9:30 if needed) Thursday August 6, Monday August 10, and Tuesday August 11.